When we consider our ideal skin, we may leave out things like visible veins. Many people live with tiny clusters of veins in their ankles or legs, which can be unattractive. Spider veins cause many people to cover up when they should feel free to enjoy a sunny day. If you wear stockings beneath shorts or skirts, or own more pairs of jeans or slacks out of necessity rather than style choice, you may benefit from a consultation with Dr. Blose for sclerotherapy. Spider veins may develop for a number of reasons, including sitting or standing for long periods, genetic predisposition, pregnancy, inactivity, poor circulation, and weight gain. Though a healthy diet and exercise may help in the prevention of visible veins, many people experience this problem regardless of their lifestyle. There is no reason to hide your legs beneath clothing. Sclerotherapy is an effective solution offered in our offices in Montebello, and Downey. Sclerotherapy is an effective vein treatment that involves injections of a precise formulation into veins to decrease their visibility. This form of treatment is great for spider veins, which can occur in large clusters, causing significant discoloration in the lower extremities, and sometimes the face. Most treatment sessions take only about thirty minutes to complete, depending on how many veins must be treated. In each session, the precise amount of solution is placed into unsightly veins. As this substance is absorbed, the vein walls are affected in a way that causes them to close up. Over the course of a few treatments, veins will naturally collapse and disappear into the body. Your legs can look better, healthier, and more youthful when you address problematic veins. You can stop covering your legs under clothing, and feel confident wearing shorts or skirts. 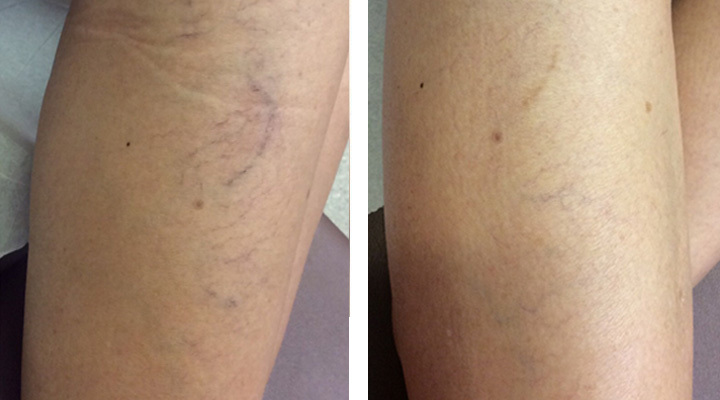 Dr. Blose has more than a decade of experience treating unsightly veins with great success. If you are tired of covering up, we can help. Contact us to schedule your visit in one of our conveniently located offices and learn how sclerotherapy can help you.